Summer has been fun, but now it’s time for Back to School. The kids are excitedly preparing by collecting all their school supplies and moms are busily preparing nutritious lunchtime menus. While having a healthy back to school lunch is amazing, sometimes we need to supplement our kids’ nutrition to keep them healthy. That is where Superior Source Vitamins can help! Super Source Vitamins are a must-have for your kids healthy! Superior Source Vitamins are much easier for kids to take, as there is NO pills for little throats to swallow. Read on to learn more and check out the FREE offers from Superior Source! What Makes Superior Source UNIQUE? Start Back to School Healthy with Superior Source Vitamins! Let’s look at the FABULOUS Back to School lineup of vitamins! Children’s Vitamin D works in conjunction with calcium to promote the development and maintenance of strong bones and teeth. Our Vitamin D products are D3, the finest source of Vitamin D available. Children’s Iron is a low 5 mg dosage suitable for children under 4-years of age. In the fumarate form, which is gentler on the stomach than other forms of iron. Vitamin C is an essential nutrient that cannot be produced by the body, therefore, it must be replenished daily. Vitamin C has several beneficial purposes including developing and maintaining healthy skin and bones, to form collagen and enhances the absorption of iron from plant-based foods we eat. Vitamin C also provides support to the body’s immune system. “Superior Source” Vitamin C 500 mg, “Sour Cherry Melts” contains very little sodium (only 1% of the Daily Requirement), it is helpful in offsetting the natural acidity of Vitamin C, creating a smoother less acidic taste. NO sugar added; only sweetened with a little stevia. This is preferable to most “chewable” vitamin C products that typically are loaded with lots of sugar. 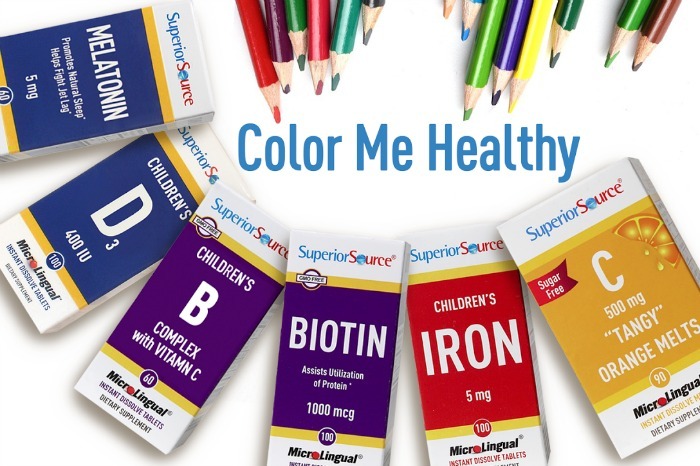 Color your kids healthy for back to school with Superior Source MicroLingual® supplements! You can find these MicroLingual® vitamins and all Superior Source Vitamins at major retailers. Use their handy store locator tool to find a store near you. Or, you can purchase from online retailers! Want a chance to try Superior Source Vitamins for FREE? If you love “try before you buy”, now is your chance! Take advantage of Superior Source’s fabulous promotional offers! Simply like the Superior Source Facebook page and you can try these amazing vitamins free! These products have Only 3 clean ingredients which is super. I really like to use MicroLingual® vitamins and find them so convenient. I do like all the colors of the packaging of these products. I think it is great that these vitamins dissolve in your mouth without water. Another super feature of these vitamins is that they are 90% smaller than regular vitamins. I would like to try the Vitamin C (Sour Cherry or Tangy Orange) – 500 mg – Buy One Get One Free. Superior Source does have a lot of fabulous promotional offers! Over 180 vitamins to choose from. I really should take Biotin each day. My nails and hair need a lot of help to appear healthier. I’m so glad Swanson’s sells Superior Source vitins! I want to try these. Great sweeps. Kids will love this prize! Superior Source does make high quality and convenient vitamins. I do want to try the Melatonin. Coloring is a great way to relieve stress and to just concentrate on something! But everyone needs their vitamins!